Carvers, start your chainsaws! 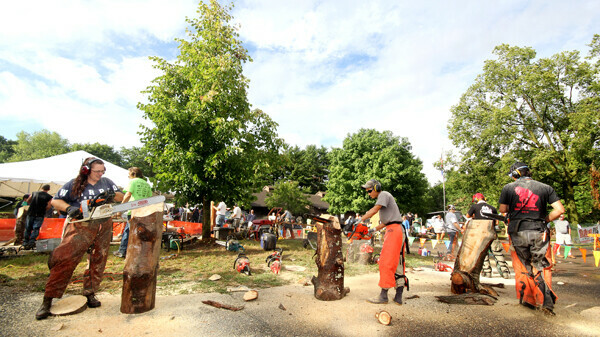 Eau Claire will live up to its nickname Sawdust City at the U.S. Open Chainsaw Sculpture Championship Aug. 7-10 at the Paul Bunyan Logging Camp Museum in Carson Park for the fourth year in a row. Ten of the world’s best carvers will compete for top prizes by transforming huge skinned logs into lions, tigers, and bears­ – oh my! – ­ in the 25-hour timed competition (eight hours on Thursday, seven hours each day on Friday and Saturday, three hours on Sunday morning). When Sunday afternoon comes, the competing gigantic sculptures are auctioned to the public. Family activities all four days include apple carvers, crafts, games, and inflated rides. Guest carvers from around the area will also show their craft. Quick carve contests and auctions are interspersed throughout, where you can bid on smaller items, like a little bear cub in a stump. The first day is free thanks to Xcel Energy. Kids ages 6 to 17 are free all four days thanks to McDonough Manufacturing. Advance tickets are available at all Gordy’s County Markets. A one-day ticket is $5 in advance, $6 at the door. The three-day pass is $10 in advance, $12 at the door. All proceeds from the event will benefit the Paul Bunyan Logging Camp Museum.